In our extended family there’s an unresolved schism over pizzelles. Several of us insist they must be anise, others favor vanilla or almond. I’ve tried them all–even chocolate–and for our family anise is the only way to go. A cup of coffee with an anise biscotti can only be beat by a cup of coffee with an anise pizzelle–and the anise makes the house smell heavenly. It’s the smell of Christmas. Then there’s the question of butter or oil? Oil–without a doubt. And it must be Wesson oil, because Mom made a batch with some other oil once and the pizzelles tasted wrong, so Wesson it is. Anise extract (me) and anise oil (Mom) is another issue, as is with or without anise seed. Should they be thin & crisp? Or thicker? How sweet should they be? How much anise? Should you add vanilla extract, or citrus zest? How about ground nuts? Making pizzelles is a family ritual. My kids look forward to it every year, and so do I. Making the pizzelles is my Christmas benchmark–once it’s done I can relax. Crack the eggs into a bowl and beat with the sugar. Add oil gradually while beating. Beat until combined, then add anise seed & extract. Add flour in several additions. Don’t over-beat , but make sure everything is combined well. 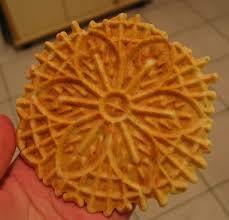 Cook according to instructions of the electric pizzelle maker of your choice. A disclaimer: our family likes a fairly strong anise flavor, so please adjust to your taste. Also, Mom usually makes about half the amount of this recipe.